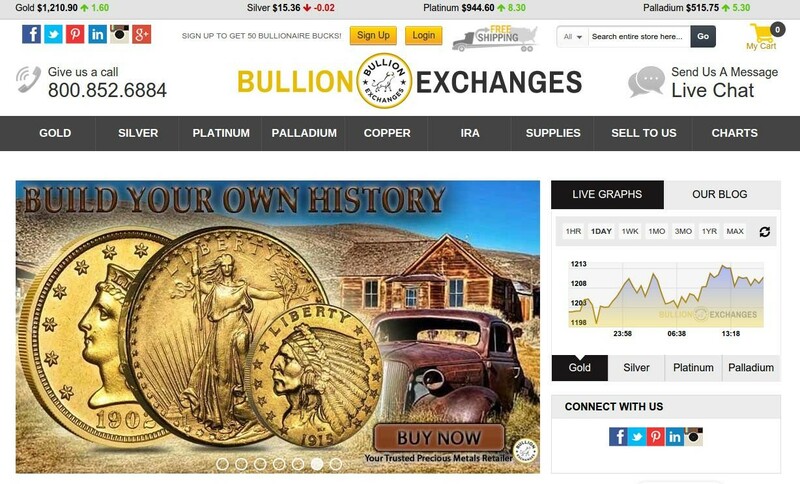 Bullion Exchanges is a New York silver and gold coin and bullion dealer that offers a wide array of products for collectors and investors. Just some of the many products Bullion Exchanges sells are American Eagle gold and silver coins, American Buffalo gold coins, Austrian Philharmonic silver and gold coins, Australian Kangaroo silver and gold coins, South African Krugerrand gold coins, Canadian Maple Leaf gold and silver coins, Morgan silver dollars and other pre-1965 90 percent silver U.S. coins, and a wide range of gold and silver bars, and much more. No matter what types of bullion coins or bars one chooses to order, all purchases $75 or greater receive free shipping. Bullion Exchanges is also an authorized dealer for the Professional Coin Grading Service and the Numismatic Guaranty Corporation. Additionally, Bullion Exchanges is accredited by the Better Business Bureau and strives to ensure that every customer is 100 percent satisfied with their orders. Located in the heart of the Diamond district, Bullion Exchanges offers its services through its website, and accepts inquiries over the phone. BEWARE unethical seller. This is the second time they have cancelled my Ebay order when the cost of gold/silver has gone up after my purchase. Then they held my money for 5 days before refunding. Obviously, they should not be offering a product at a price they are unwilling to honor.